PHOENIX — You buy a warranty for peace of mind. That's what Christie Neilson thought she had, spending hundreds on a 10-year pest control warranty. But 3 years into it, her company, Amera Sun City Pest Control, was sold. The new owner, Atomic Pest Control wants another $125 to "activate" the warranty . Christie doesn't think that's fair, and about 24 other people and counting are letting me know they feel the same way. 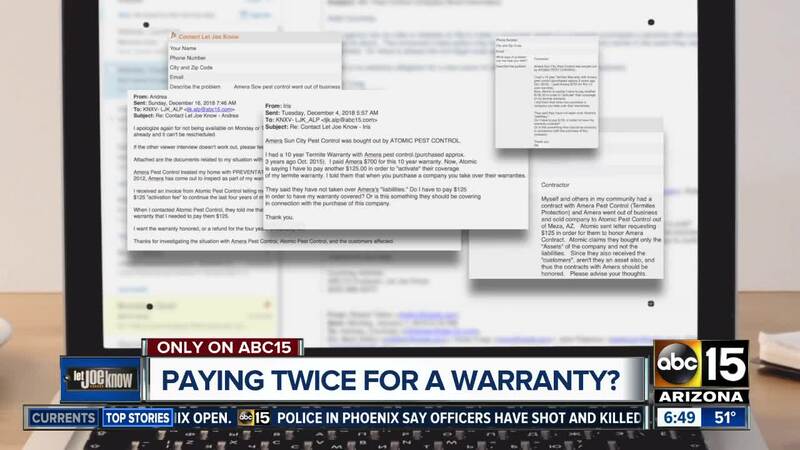 So we're taking a deeper look at how the company was sold and whether warranties should be covered as is. Atomic says they did not buy Amera's liabilities, so they are not responsible for the warranties. That argument was written in a letter from the company's attorney and sent to customers who filed complaints with the Arizona Attorney General's office. Such language is a common part of sales agreements. But we received another letter with Atomic Pest Control letterheard. The sender says it was sent to a property management company, a client of Amera Pest Control and dated October 2018. The letter says "this merger has been in the process for a year, while we slowly merged two companies into one." In fact "merge" is mentioned 3 times in the short letter. The American Bar Association says "the surviving company in a merger assumes all liabilities." So which is it? A purchase or a merger? We tried to get answers from the business but did not get a reply. So, we went to the business address for Atomic Pest Control in Gilbert. Owner John Beebe was not there. We left a message with a worker we needed to talk with him. Beebe has still not responded. Since the businesses are private, agreements are too. The state doesn't regulate these warranties, calling them more "guarantees" for the work done. Buying long-term warranties is risky. Companies do sell or go out of business. You can sue, and that is one way you can find out how the business was sold and what responsibilities they have. Read what Consumer Reports says about warranties.